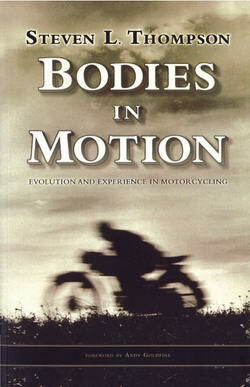 Someone gifted me Bodies in Motion, Evolution and Experience in Motorcycling. (Steven L. Thompson. 2008. ISBN-13: 978-0-9819001-1-7. 417 ppg.). I had been given a review copy by Aerostich shortly after its publication; my review is here: http://bit.ly/GYvfUL. So if you'd like to have a brand new, still in the plastic wrapper copy, mailed to your USA address at no cost, just send me an email ("doug at tiltedhorizons dot com") with "Bodies in Motion" in the subject line. I'll draw a winner over Easter weekend.